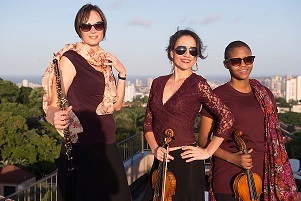 Durban’s celebrated Baroque 2000 ensemble delivered a treasure chest of five short, but energetic pieces at their concert at the Church of the Monastery at Mariannhill last Sunday. As the title of the recital suggests the highpoints of the event were two double concertos which featured some fine performances by the soloists. Johan Sebastian Bach’s Concerto for Oboe and Violin BWV 1060 in D Minor showcased the combined talents of Margrit Deppe on the oboe, and Baroque 2000 Concertmaster, Ralitza Matcheva on the violin. Deppe, a tall, elegant young woman, is a KZNPO stalwart and a frequent guest player with Baroque 2000. She revelled in her solo role and, adeptly supported by the effervescent Macheva, produced a performance filled with flair and delicacy which earned both women a much-deserved standing ovation. Deppe also had the opportunity to show off the capabilities of the oboe in Tomaso Albinoni’s Oboe Concerto Op 9 No 2 in D Minor. Albinoni was particularly fond of the oboe, a relatively new introduction in Italy in his time, and he is credited with being the first Italian to compose oboe concertos. He treated the oboe as a lyrical and melodic instrument, much as the voice would have been handled. His Op.9 No. 2 in D minor is possibly his best-known oboe concerto with its sublime Adagio Second Movement. Deppe performed it with great credit to the work and her instrument. Also on the programme where the Concerto Grosso in F Minor by Alessandro Scarlatti, and the Trio Sonata No. 5 in E Minor by Nicola Antonio Porpora. I had not heard any of Popora’s music before and this flamboyant piece is particularly interesting in that it is performed by only two violins, a cello and harpsichord. Porpora was an Italian composer of Baroque opera works and a singing teacher. Despite his success and international fame during his lifetime, his life ended in poverty. The next Baroque 2000 Concert at the Monastery will be on May 6at 15h00. This will be soon after their return from Zimbabwe where they will be the resident orchestra at the Harare International Festival of the Arts (HIFA) for the third time. Tickets for the Baroque 2000 concerts are R150 pp and available at the door. There is ample and safe parking available at the venue. For more information, contact Michel at sursouth@iafrica.com or call 082 3035241.